Smart technology is changing the way people live their lives – allowing you to have a wide array of services and gadgets at your fingertips. It’s the way of the future and it seems to be the popular choice for the tech savvy business owner. Plus, using smart technology in your business can even save you money – who doesn’t want to save a buck or two? Not to mention, it can even save time and we know how important time is. A smart thermostat uses WiFi and gives you the opportunity to improve the energy efficiency of your home. 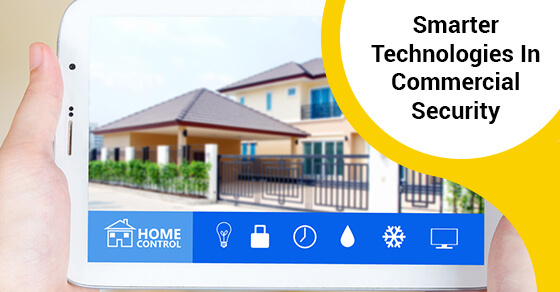 You are able to control the settings and temperatures from your laptop, tablet, or smartphone. You can save on your heating bill as you are able to monitor and track the temperature and adjust accordingly. These thermostats can be integrated with your security system to automatically turn up and turn down the thermostat settings based on whether the system is armed or disarmed. We can even program the system to adjust the temperature settings based on how close you are to your business. You are able to monitor your business remotely – you are able to arm your alarm, check for movement with the motion detector, and have peace of mind in knowing that your business is secure. Our Partnership with Alarm.com allows you to have control of the alarm system and check its status at your fingertips through an app on your iPhone or Android-powered device. Speak with a security specialist to find out what services are available in your area, and to get the best home protection offer for your home and family. This is a newer technology from Kantech which eliminates the need for a costly server located on your premise and the need to have someone on site to manager your card access solution. Doors can be locked and unlocked from anywhere in the world from your phone, users can be added and removed immediately from anywhere you have internet access, improving your business’ security and efficiency. FMC can even manage your cards and systems for you. This technology allows video fro IP-based cameras at your business to be recorded to the cloud, rather than having an expensive video recorded located on your premise. This requires a high-speed internet connection, but allows 30 or 60 days of storage to be recorded off site, reducing the possibility of hardware problems which can occur and prevent recording. These systems also allow you to view live video and recorded video from anywhere in the world via a smartphone or laptop. At Fire Monitoring of Canada, we take care of all of your home security and fire protection needs. Give us a call at 1-888-789-3473 to find out how we can help to make your business and employees feel secure.